Our expert pre-press team will run your files through our extensive 21-point inspection for FREE! This way you can rest assured your order will print as you intended. Let our talented graphic artists create a professional and unique design just for you. You are the BOSS! 4" x 6"5.5" x 8.5"
We'll check your file(s) and try to fix any issues you may have. Then we will create a PDF proof and email you for your approval. Note: Printing turnaround time will begin after we receive approval and full payment for your order. This option may delay your order by one or more days. Please note our cut-off time is 9:30 AM pacific standard time. Turnaround will start on the next scheduled business day if its approved after the cut-off time. Please note our cut-off time is 9:30 AM pacific standard time. Turnaround will start on the next scheduled business day if its approved after the cut-off time. Please note our cut-off time is 9:30 AM pacific standard time. Turnaround will start on the next scheduled business day if its approved after the cut-off time. Please note all orders with 100 lb. glossy paper that have print turnaround of Standard, Rush or Same Day will be printed on a digital press with matte ink. This will make your prints look non-gloss. Get started on a custom design Let our talented graphic artists create a professional and unique design just for you. You are the BOSS! 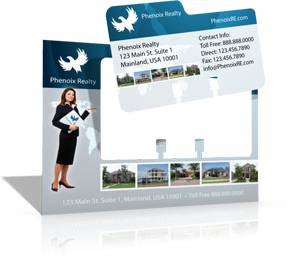 Rolodex Cards are a great marketing tool that gives your customers something to hold on to. Just mail it like a postcard and your customers can simply pop it out and place it in any standard size rolodex holder. 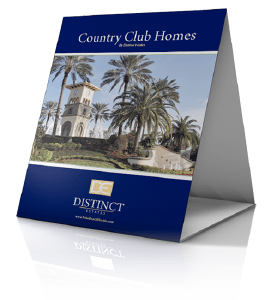 With a customized full color tab, you will surely get noticed. Stand out from the rest by printing high quality, rolodex cards with Printfirm, Inc. While not as many people use Rolodex organizers as in the past, there are still plenty of people who prefer this easy, non-digital method of organizing information. 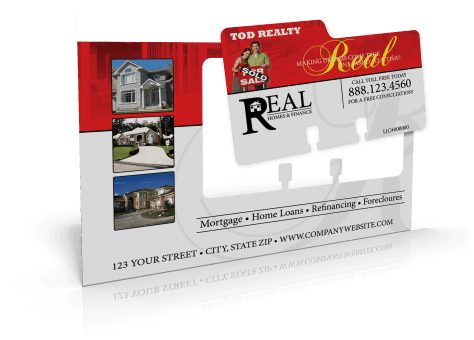 Our Rolodex cards are printed on a postcard so that customers can receive them in the mail with direct mail marketing. Upon receipt, the customer can remove the Rolodex card from the postcard background and insert it into any Rolodex device. Our rolodex cards are printed in full color on premium 14pt. 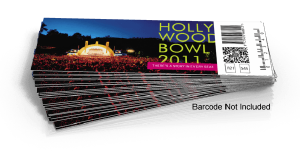 card stock with the choice of UV Coating on one or both sides, or a Matte Finish. Our 14pt. card stock is known for its thickness and durability and popularly used for business cards, postcards, greeting cards, etc. Adding UV Coating gives it a high gloss finish which protects it longer from getting scratched or dirty while the Matte finish gives it a flat professionally feel. No matter what look you are going for, let Printfirm, Inc. help make your job easier. PrintFirm can help you fill your Rolodex printing needs. We use durable 14-point card stock for Rolodex printing. Size options include 4” X 6” and 5.5” X 8.5”. The larger size does not change the dimensions of the Rolodex card. It simply enlarges the postcard background. 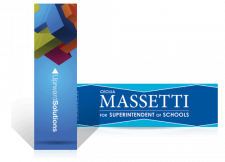 This size can be useful in your direct mail marketing campaign if you want to increase the visibility of the postcards in the mailbox. You can fit more information in the postcard section which allows you to add a “call to action” message if you want. 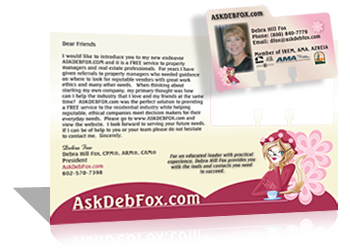 You can upload a print-ready Rolodex card design to our website. We accept all the popular graphic design files such as PDF, AI, and TIFF. 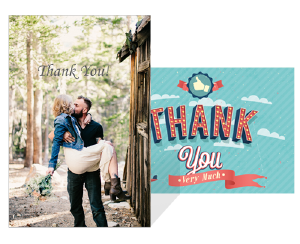 You can also choose from our pre-made design templates that include a basic graphics background for the postcard and Rolodex sections. This saves you time during the design process. If nobody in your organization is skilled at graphic design, you can select the “custom design” option from our website when you place your order. Our talented team of in-house graphic artists will create a design for you. PrintFirm recommends a minimum resolution of 300 DPI (dots per inch) for all uploaded images before proceeding with Rolodex card printing. Lower resolutions may look fine on your screen, but the printed result is typically a fuzzy mess. Use caution when adapting images found online because they are generally low resolution. To check the DPI, open the graphics file in a reputable graphic design program and view the file details. It’s not a good idea to crowd the design for your Rolodex cards or the postcard background. Adding enough whitespace (area without design) is crucial for a professional appearance. Any direct mail Rolodex cards should be easy to read in the mailbox, and a crowded design may reduce readability. If your headline does not grab attention in the mailbox, the recipient may throw the card away without a second glance. Please consider PrintFirm for all your Rolodex card printing needs. We believe that quality is just as important as giving discounts for quantity.